Bognar was able to develop skills, insight and expertise that helped establish him as a leader in his field. In the late 90s, Bognar was hired to work with a small team of consultants to produce a report on injection drug use in Vancouver’s Downtown Eastside. The findings from the report contributed to Vancouver’s movement towards a “Four Pillars” approach for dealing with injection drug use. The Four Pillars Drug Strategy was first implemented in Europe in the 1990s, and is based on four principles: harm reduction, prevention, treatment and enforcement. As part of this approach, Vancouver opened Insite, North America’s first and only medicallysupervised injection site, in September 2003. At this time, Bognar was hired as coordinator to implement an evaluation plan, which looked at the effect of Insite on individual health, public health, crime, community safety and public perceptions. The Four Pillars approach to drug addiction has resulted in a decrease in the number of drug users consuming drugs on the street, a significant drop in overdose deaths and a reduction in the infection rates for HIV and hepatitis C.
Bognar, along with like-minded researchers and activists, moved to secure funding for a community-based organization dedicated to promoting the health of gay men in Vancouver and, as a result, the Health Initiative for Men (HIM) was established. As chair of the HIM Board from 2007 to 2012, Bognar served as a mentor for board members, volunteers and HIM executive director Wayne Robert. “Because of his vast experience as a researcher, Carl was able to embrace problems, think strategically and present different perspectives while working with others,” recalls Robert. Combining their expertise, the Board, volunteers and HIM employees have established groundbreaking policies, procedures and approaches to gay men’s health, and Robert is often contacted by others to discuss the successful implementation of the HIM model. Bognar is modest when it comes to his role in these two initiatives. “Insite and Health Initiative for Men were not projects that any one person or organization could do alone,” he explains. “There were a lot of people who came together to work in partnership and make great things happen.” Bognar also credits his social science background. 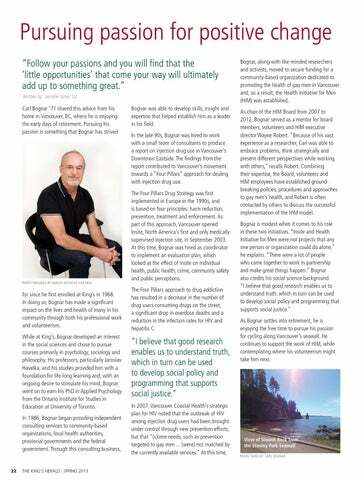 “I believe that good research enables us to understand truth, which in turn can be used to develop social policy and programming that supports social justice.” As Bognar settles into retirement, he is enjoying the free time to pursue his passion for cycling along Vancouver’s seawall. He continues to support the work of HIM, while contemplating where his volunteerism might take him next.